With life insurance, your survivors won’t have to worry about probate, taxes, or other delays and problems associated with estates. With guaranteed issue life insurance, you won’t have to answer any medical questions. In addition, you won’t be asked to take a physical in order to get approved for coverage. You may have heard that life insurance companies are very selective. You may worry that insurers will decline you or your parents because of age or a pre-existing health condition. If this is true in your case, know that you can purchase guaranteed life insurance policies. You don’t need to answer a single health question or take a life insurance exam. Many providers of guaranteed coverage accept applicants up to age 80. Your policy covers your entire lifetime. Its never canceled if you pay your premiums on time. Typically, this kind of coverage is aimed at older folks, from about age 50 to 80. Basically, these are small whole life insurance policies. You can buy a coverage with death benefits ranging from about $5,000 to $35,000. They are meant to provide the families of the insured person with a cash benefit that can help pay for funerals and other types of final expenses. Since they pay benefits in cash, the beneficiary is free to use the money in any way that they choose. You might wonder how life insurance companies can possibly offer to cover everybody without requiring a physical or answers to a lot of medical questions. After all, these insurers plan to make a profit and not just attract applicants who are already very ill. Instead of health underwriting, these guaranteed applications use waiting periods. For instance, the policy may only pay the full death benefit if the insured person survives the policy issue day by two or three years. Before that, they may either pay a portion of the death benefit or refund premiums paid plus interest. In any case, the family of the insured person won’t lose any money. After the waiting period ends, beneficiaries can collect the full value of the policy, just like any other life insurance. If you enjoy relatively good health for your age, you might qualify for life insurance that requires an application. Insurers also market simplified issue life insurance policies to middle-aged to elderly folks. These policies only require answers to a few health questions and still don’t need a life insurance physical. Rates for policies that require medical underwriting will be somewhat lower. Your beneficiaries receive the full death benefit without a waiting period. Insurers may allow you to purchase larger amounts of coverage. You may even be able to choose term life insurance if you would prefer it to whole life. 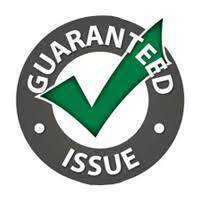 Who Should Consider Purchasing Guaranteed Issue Life Insurance? Some older folks purchase this kind of coverage as a simple and affordable way to help their children or grandchildren. They may want to pass on some cash to family or pay their own funeral expenses and tie up loose ends. The National Funeral Director’s Association calculated the median cost of an adult funeral and burial in the United States to be over $8,000. It’s tough for many middle-class families to come up with that kind of money when someone dies. Very often, adult children will offer to pay premiums. After all, survivors will really benefit from the cash after their loved one passes away. It’s hard to find a beneficiary who wasn’t grateful they received proceeds from a life insurance policy. Older folks who have a serious illness or already require nursing care aren’t likely to qualify for a medically underwritten life insurance policy. This makes guaranteed issue life insurance a good choice for them and their families. At the same time, active, seniors with typical health conditions for their age may qualify for a simplified issue policy. You should contact a licensed professional or click our “View Quotes” button above to compare plans. No grieving widow or children every regretted having the cash benefit from a life insurance policy. The named beneficiary on the policy can promptly expect to receive a cash benefit that they can spend or save. Concerns about the questions on the application or having to take a physical shouldn’t keep you from getting covered. You can either purchase this kind of coverage on yourself or on an aging parent or other loved one. If you’re like most you love a guarantee. Buy guaranteed acceptance life insurance no waiting period now!